Have you encountered another Craigslist scam not covered here? Let us know in comments. I have been looking at used cars lately and am finding a lot of bogus ads. For example a Lexus for $1200. or other deals that are far too good to be true. I've always wondered they are attempting to gain by posting such ads. They are frequently flagged and removed within hours, but they are overtaking the legitimate ads. What's the deal? When trying to get a car for our son, we looked into a car with a price which seemed to be a bit too good. When we inquired about having the car looked at by a mechanic, we were told it was on a military base and the owner was about to be shipped to Iraq. We were told the car would be shipped to us once we sent money to one of those escrow sites mentioned above and the money would be refunded if we were not happy with the car. Yeah, right, and what would the dude do about the car now that he was in Iraq? Recently I set out to flag all these obvious bogus car ads (boats and RVs as well) in our local CL and had almost eliminated them but CL is no longer paying attention to my flags and leaving the ads in place. I think CL probably sees the bogus ads as money in their pocket since it adds to the number of total posts they have thus adding to their stature as a place for advertisers. 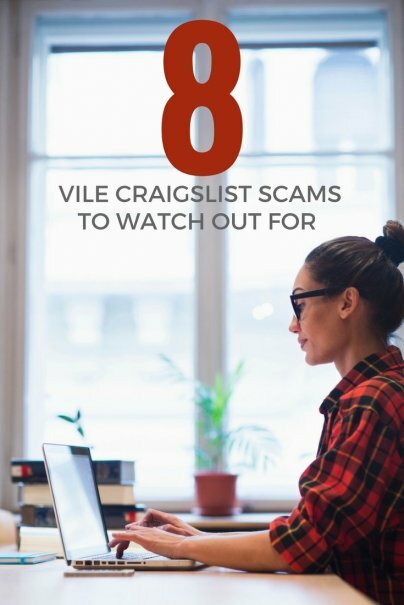 I find that most of the return email addresses on the car, boat and RV ad scams are usually a female name like Adelaide, Georgia, Linda, etc. Most seem to use gmail email addresses. I guess the scammers think a female name increases your confidence that the ad is posted in good will. and there can be up to 5 or 6 gmail accounts linked together and one can check other gmail inboxes without having to log out or put password again. I've used Craigslist extensively for 8 years and have definitely seen my fair share of scams. I avoid #1 by meeting in public, well-lit places. Most of the other online scams are fairly easy to spot. The emails seem fake and out of place. I completely agree. I've used Craigslist for everything from apartment hunting to car shopping (I actually just got bought a car last weekend through Craigslist) — and overall I've had awesome experiences. BUT I think that's mainly because I'm incredibly wary of any possible scam someone could be trying to pull. I've definitely run into multiple scammers who "are moving out of the country tomorrow" - which is why I've learned to trust my gut. If it seems out of place, or if it just doesn't feel right, it's not worth pursuing. I also make sure to speak with the person prior to meeting, which may not sound fool-proof, but you'd be surprised how much you can glean from a simple conversation beyond the computer screen. The local police where I live have said they are fine with people meeting up with the buyer/seller at one of their precincts or roll call locations for the purpose of buying or selling something off of craigslist. Chances are, if the person who is either selling you something or buying something from you has other illegal ideas in mind, they won't agree to meet at a police station! I will take advantage of this offer next time I am using craigslist! That's a excellent idea. I mostly use craigslist to buy and sell video games so the clientele are usually cool, down to earth people. I always meet at large gas stations like quiktrip because there are always people going in and out, and there's usually a cop or two there as well. I never let people meet at my house because I have two small children and my wife to look out for. Also, I started taking a counterfeit pen with me to check money. Not because I think that they have a money printing machine in their basement to scam me out of a $20 game, but because you never know if some of the money already in circulation is counterfeit or not. If you're going to meet with cash, meet in a bank lobby. Lots of cameras and security. That is a great idea! I've noticed that many gas stations have lots of cameras pointed toward their pumps, so maybe that's another secure location. Because of these scams, I've largely decided to stay away from Craigslist. I know people personally who have been scammed and almost lost a lot of money. If you are going to use Craigslist, follow the writer's advice and bring your friends for backup. Wow, these things are absolutely crazy. I'm such a paranoid person I've never actually used Craigslist. I use eBay because it seems much more secure, but i have bought stuff that just isn't up to standard. I recently bought a call-phone that had a 14- day return policy. Of course it took like a month for the phone to start acting up. The scammer will call you about your item for sale and question if you really have the item. Then they will send you a 5 digit code and tell you to send it back to them. They use another phone number to send the code from. Once you send the code back to them you just signed up for a subscription. You can have a limit put on your cellphone for monthly subscriptions to protect yourself. N.B UPS/FedEx does not deliver to a P.O box addresses.Thanks"
Umm that is definitely a scam. The "check" they are giving to you is a fake and if you cash it you will be responsible for the lost money from the bank. Anything that says "dear" or "please kindly" or any other grammatical sentence structures of the sort ARE scams as well. And why can't you call him? He is "hearing" impaired? You are most likely talking to a foreign scammer from india, africa or any of the other countries they do stuff like this on! Excuse me Fran, but I feel particularly inclined to remind you that most Craigslist scammers are in the United States in the city they are probably scamming. Scams happen everywhere. Don't be so quick to blame "other countries". I just recived the same reply. My gut was tellng me something was wrong. I was offered 30.00 extra for taking the craigslist post down asap. Wanted my name...address..no po box...cell phome#. Was to be paid via curior and movers will pick up the item as soon as the cashiers check was cashed. Go with your gut. I received the exact email for a hutch I am selling. Also 4 others with similar responses. My question is what would someone have to gain from this scam? I don't understand how they could benefit from this? I got the same note almost exactly. A friend said that these emails never mention the item specifically. I did send my name address and phone number and I am worried what might be done with this info. like the other writer below. I never received a check (yet) but if I do I plan to take it to the police. Any thoughts or suggestions? Hi Mark. This exact thing just happened to me! But with a Paypal acct. What was the outcome? I just gave them the info yesterday, but thinking it could be a scam started searching. thanks for any info you can give me. I just received an identical response (text) from an "Anthony" who is interested in buying my piano. No questions, no negotiating, but is willing to send me an extra $54.00 over my asking price. He claims once his Certified Check has been received and cashed, he will arraign to have his "Private Shipping Company" pick up the item. Wow, what a nice guy. His phone # is 1-405-730-9642. Beware. My almost identical text had suspiciously bad grammar (things like "50$") and offered to send a money order 50$ "over, so you can keep it in on the item delivery mode"..... What the hell does that even mean?? Anyway it's obviously some foreigner who asked for my "fullnames and address", which I would never send to something this fishy. Instead I requested he give me a phone number so we can talk, and of course I haven't heard back from "Dray Mark"! Yeah, that's a scam. I had something very similar happen to me. In my case, the guy said he was away on a business trip and wanted to mail payment for the item to me ASAP so that the "mover" could get it, could I send the information for that? Like with you, he listed that information he wanted, nice and neat. For mine, he specifically requested no PO Box (Warning Bell #1). Probably what makes the message feel off is that it's written like it's not from a native English speaker. The same was for mine - it sounded like it was either written by someone who had a vague grasp of English or like it was generated by a computer program. For my message, I also got the distinct sense that the "buyer" hadn't actually read/processed my e-mail to him. He opened it with, "Yes, the price and the description both look alright to me". In my previous correspondence with him (the only time I wrote to him), I had not mentioned the price at ALL. What I HAD mentioned was our meeting location (not at my place), the time, and if we could possibly meet in a week's time so I'd have a chance to get the item lined up (he wanted to meet ASAP, like, the very day he contacted me. Warning Bell #2). All off the things I had written about were not addressed by him at all, either as a confirmation that he got it or as answering the questions I had about the date of our meeting. Oh, and he also never contacted me again, after I asked him if we could possibly hold off on the deal until he was back from his "business trip". No, he didn't even give a, "Sorry, I can't do that. Bye!" I just posted a brand new bike on Craigslist list this afternoon. By early evening, I had a text (my mistake for putting my cell # - which I went back & removed), stating they would pay an extra $50 for me to remove my ad, and they would have their"assistant" mail the payment, so could I please send him my full name and address. Also, he would be liable for the cost of picking it from my location to his destination. Yes! This is a scammer. Ignore him, but him on your block/spam list and carry on. You can smell scammers a mile away. I had a large item for sale on 5 mile and someone offered me $40 extra to hold item and remove listing as sold. They had a new ID with no available history plus they mentioned a shipper coming to pick up the item. I got suspicious after I removed the item as sold and received no text message or sale date. I relisted the item and never heard from them. Other sales sites are fair game for scammers. he will be adding $30 for holding it for me.. End-I told him NO. I got the same exact letter from a Brittany. In the emails leading up to it, I found it weird that she kept referring to my table as "your item". And there was that request to take the CL listing down immediately. Nope, not until the table is gone. And they are out of town. Oh well, there will be other buyers, maybe... and if not, oh well. I also had a response to a piano for sale ad I placed. The response was broken English, they wanted my full name and address where to send the check. Once the check cleared they would send a moving company to pick up the piano. Can anyone explain what the criminals can do with knowing my name and address info? I can't figure out if they have other personal info and just need this other information, or whether just trying to cash their check will give them the info they need to scam me. Pimps are a major problem in Talent, Event, Domestic, Crew and even Creative Gigs. In the San Francisco area, these sections often contain posts looking for "models", or "dancers" which are sometimes easy to spot, but anytime you see any post for a need a female for an assistant for a busy executive, date to the opera, date for lunch, someone to serve drinks at a private party, etc. IT IS A PIMP. They are looking to find women who will go on dates for money. It's all about the social engineering. They then try and hook them into lunch for a presentation (the usual pitch). If you are in doubt, use a fake email address with a female name and respond asking for more information. I flag relentlessly (I have three different machines in three different subnets that I can remote into, but they are like cockroaches - they keep coming back...) If Craigslist would respond to complaints about this it would take a majority of them out, but craigslist doesn't do anything until the police or district attorneys make threats. I've been scammed recently on a vacation rental apartment abroad, foolishly transferring a payment for a deposit. So the money is gone, my concern though is that I gave them my address and dates when we will be away. Is there a risk of being robbed while away because they have this information? Or is the scammer only interested in the money? Is there anything I should do? i am based in Europe, not sure where the scammer is based, possibly US as i was asked to make a transfer to a US based 'accountant'. I would definitely have a house sitter or change the dates of my trip. I have to imagine that there is an underground network where this sort of information would be valuable and have a market value. If i was you i would have a house sitter at your house for the times you said you would be gone. I just caught my landlord in a scam. She rents out rooms in her home, only there are no rooms available. She requires the prospective renter to leave her with a month's rent and a month's security and tells them that the room will be available in a week's time. When the renter shows up to move in, she tells them that there was a problem getting the present tenant out, and claims that she is having trouble with the bank getting her money out, then she ignores any future calls from that person. She knows that the police will do nothing except to tell the unfortunate person who got cheated that "it's a civil matter" and they have to take her to court. Most people who rent rooms don't have either the knowledge or the money to file a suit against her, and she seems to be getting away with it. We have tried twice to but a used Treadclimber from craigslist in two different states. Both have been scams and even months apart the return email stories were similar. Both claimed to have moved, one out of the country. Neither would talk to us on the phone. Both wanted to use eBay protected buyer program instead of cash and asked for a bunch of personal info to get us 'registered'. Then asked us to wait until eBay contacted us. Thankfully this was acted flag and We never gave our info. Both times the machines were not located where they were posted, both needed shipping, both sellers sent way too much detailed personal information about why they were selling. Both wanted to make sure we had money ready to go. I have bought and sold many times on Craigslist and legit sellers want to talk on phone- they want cash and they are willing to do a quick non-complicated interaction. They never ask if you have money ready to go. Isn't hat a given if we respond to an add? I had a similar situation trying to buy a car. I need a car badly and because my income is low I need it to be cheap,. Every day without à car means I am losing lots of potential income. So I was acting out of desperation and found the "perfect deal". Since I had not done this before I did not see any red flags at first. The lady said she was selling so quick and cheap because her husband died a month ago from a heart attack and she was moving out of state to be close to her brother. I was even feeling sad for her and told her I was sorry for her loss and even shared a bit of my story. We had a few emails back and forth and my first red flag was that she would never use my name nor reply to certain things I would say. There were also phrases such as," as I said before I will pay to have the car shipped to you". She had never said that before, nor did that make sense to me. She said she was using EBay Motors and she told me they would send me an email explaining what I needed to do next. The flow of things just did not feel natural to me so I googled EBay Motors and found that they never send emails. It was a scam. I was sad that I had been dupped but I felt lucky I did not send the money. Watch out for this: You are selling something from your home that you cannot meet someone for ( heavy furniture Items that can't be moved easily) You are contacted by someone that doesn't even want to look at your item and agree to the cost right off. They are VERY interested and want to come pick it up: They ask for the address before they even attempt to set up a meeting time. If you give it to them they start asking you about possible meetings time...THEY NEVER AGREE TO A TIME WHEN YOU SAY YOU WILL BE HOME BUT SUGGEST OTHER TIMES HOPING YOU WILL SAY "WE ARE NOT HOME THEN". THIS CAN HAPPEN WITH TWO OR THREE DIFFERENT "INTERESTED BUYERS" WORKING TOGETHER. What is happening is that you are basically telling the same people when you won't be home. Pretty much a burglary ring setting up your home. and never hear back from them. I have been applying for jobs advertised on Craigslist that describes front desk receptionist. I get an email back stating that position has been filled but, he needs a personal secretary....I have received many of these saying the same thing....$500 a week, they are always out of the country and will contact me as soon as they get back, very confidential but need me to start now..just send them name, address and telephone...but, i had sent my ruseme' already....i know this is a scam so be careful. I've also replied to many job listings and received 5 or 6 of very similar responses. They all say the position has been filled but they are in need of a personal assistant to do a number of different things that include cashing checks, sending money orders, buying and sending goods, etc. They all claim to be out of the US currently but are willing to send payment upfront. It's always $500 wkly or more. I had a Tijani Rammykush offer to pay me $2000 every 2 wks to clean her apartment while she was over seas! The only "problem" was that her secretary accidentally sent my pay and the painters pay. So I was to cash this enormous check and send most of it to someone else. I couldn't get this lady to really answer my questions. It was all too vague. I must've asked too many questions because I never received that check. This is very discouraging when you're really seeking employment! Help me figure out what kind of scam attempt this was...I had a chair for sale, guy emails that he wants to buy chair and to call him (I thought the email was a little abrupt, but not everyone has the same style). I called the number, but it was a wrong # (this may have been an honest accident because it turns out two numbers were transposed when he actually called me). I emailed him back that he had given me a wrong # and to call or text (my cell #). He called later and sounded a little weird (nervous, high?). My red flags were at half staff, but I was anxious to sell the chair and my husband was home with me. He asked if he could come right then, and I said yes if he was on his way, and so he asked me to text him my address which I did. (This is how I normally operate with CL sales; I give out my address only when they say they are on their way.) So then he called back from a different # (I recognized his voice) and said "OK, so I checked her out and she is 53 and a Catholic..." (which is not a description of me by the way), and I cut him off with "Whoa, you have the wrong #" and he said "oh, who is this?" and I said "whoever it is, it's not who you want to be talking to" so he hung up and then texted me a few minutes later "I'm sorry but the Furniture does not fit mine" I ignored him from that point. Is this an attempt at identity theft? All is he basically has is information that is publicly available (name, address) and my cell and email. What exactly can he do with this? My husband is freaked out that he was setting up a burglary, but I think it's more along the identity theft lines. As far as job scams go, I also have gotten responses back from jobs saying that the position has been filled and that they are looking for a personal assistant "who can be trusted... make pick ups and deliveries on their behalf and have stuff mailed to [me]" etc. I applied to an add on craigslist for an RV. Gave them my physical address. Was told that I'd be hearing from eBay motors. Was not asked for any money. It's been 4 days and I have not heard from either parties. I have never done this before. Should I be concerned for my safety or does the whole process take this long? I hope that all is well for you. I got the exact same request this morning when replying to a car for sale. I did not give my address, but they have my first name and legitimate work email. Be wary of anything out of place or 'weird' with your surroundings and maybe report the info you have to the internet scam service listed on craigslist. Good luck and be safe! I have someone that sent me a check that was wired through their bank. I was told that he is out of town and he will schedule a mover to come and pick up the chair once I deposit the check. The chair is $300 and the check is for $1572.35. Is this a scam? Yes, it is. The check is fake. The buyer probably asked you to pay the mover through a wire service of some sort. You will lose $1500.00 on this! I had a similar thing happen to me. I was selling a recliner had a so-called doctor wanted to buy on the spot and have friend come pick it up. He explained that he accidentally sent his paycheck to me and that he say I could keep a generous amount for myself(which was very odd) and mail the rest to him. I almost fell for it until a co-worker overheard my conversation with another co-worker and told me that it was a typical overpayment scam. I'm so glad that person listened in. I am in the middle of one of the "Overpayment Scam" right now. What do i do with the check when i receive it? whats the email of the person that sent you the check? and you should actually throw it away or gie it up to the authorities. I have just been a victim of a craigslist s scam. My bank account is now negative of $2519. Here is what happened: On Saturday, April 12th of this year (2014), I answered an ad from the famous craigslist website for a child caregiver job. The mother, who goes with the name of Laura Johnson answers me Sunday, 20th via email. She tells me that she is moving from Phoenix to Los Angeles because last December she lost her husband and her 4 months old baby in a car accident. She tells me that the only survivor is her 6 year old kid, named Joe, who is now in a wheelchair. Of course I am affected and moved by this story. I even cried when I read her email. So she needs a babysitter/caregiver for the first weekend of when she arrives; May 10th and she wants us to meet the 9th to assure that I am reliable. She sent me a picture of her and her handicap son. Everything was very believable. She wants to have everything ready for when they arrive in Los Angeles. So she asks me to accept the delivery of the new wheelchair she ordered so that it is here for when they move. The wheelchair is supposed to be delivered at my own place. She sends me a check of $2775 to pay for the delivery and to cover my first week of work ($2523 for the wheelchair + $252 for my first week paid in advance). She asks me to deposit the check at the bank and then to transfer it to the seller who will deliver the wheelchair. So I do. The check got returned to the bank and my account is now in a negative balance. I contacted the bank and they tell me that I am responsible because I am the one who deposited it into my account. The bank will not return me the money. The person to who I transferred the money is named Orma Daniels, she banks with Bank of America and I have her account number. Also, the check that I have received of an amount of $2775 was sent through Fedex and a signature was required. It was sent from a person named Tyler Jones and the sender's address is; Stihl Inc. 536 Viking Drive Virginia Beach, VA 23452 I kept the envelope. We first communicated via email and then switched to text messaging because it was quicker. She also told me that she was death so I could not call her, this should really have ringed the bell, but I was so happy to help someone in need that I did not even pay attention to all of those (now obvious) signs. As soon as the money was transferred, she told me that she would contact me for the delivery of the wheelchair and then never got back to me. We set an appointment for the delivery the next day but she cancelled it and I have never heard from her again. I have ALL of our email conversations and text messages. I also have the original craigslist ad. I took pictures of the check that I received (to prove her that I had received it well) and pictures of the receipt of the deposit that I made on the seller's account. I was worried that she would think that I was a scam and that I would keep the money for myself. I could not imagine that she (or HE) was actually the scammer. I have witnesses, friends that were with me when she (or he) was texting me to go to the bank and send her proof of the deposit. And my mother to whom I very proudly told that I had found a new child caregiving job. I have recently been looking for cars. Every person I have come in contact with is mysteriously in a different location than which they posted the ad in. I have now received the same exact story from 2 people and very similar stories from others. They are either in the military or some family member has died. I almost fell for the first one, but when things didn't add up I was able to get out of the scam. Do NOT fall for it. These people are very smart and convincing. Can't trust anyone now days. I now know that meeting in a safe public place is the way to go, and to never send money via internet. Please be aware and smart while using craigslist! I just posted an ad to rent our rooms in our house over summer and got a reply from someone named Klara Smith and she says that her father is wiring a check to me for the rent, and also included in the check is money for me to pick up her car. She is allegedly moving from Europe so she needs to be picked up from the airport in her car and she says the check is already on its way. I have a gut feeling that this is the Overpayment Scam. Am I right? She asked for my address and name and phone number. Should I just block her emails? I have one to add and it's also a job scam. It was a warehouse job. The listing was the first red flag. It said way too much and then didn't completely relate to what the job actually was in their response. Second when you contact them they respond by saying your a perfect fit. You hired! The pay was amazing for the time they needed you. The person hiring you contacts you and says they trust your resume so no interview needed. They are in Europe and needs you to fill in for them for 3 months part time. It always took 24 hours for them to respond to any questions and they never answer what you ask, never tell you where the company is or it's name. Finally they send you your "salary" and "fees" to cover shipping in the form of a large check. My spider senses were going crazy so I didn't taken by them but it is awful how they target the unemployed. I have a detailed post about this on my blog. Had 2 used counter tops on craigslist for 60 a piece Got a call . The caller States, Will be sending more than amount so the people who pick up the countertops can be paid. Just deposit the check in your account and when they arrive pay them. they sent 1489.00. What? The whole thing was a scam and my bank shredded the check. Thank God I did not do what they asked. My account would of never recovered and I would of been devastated, being on a set income. What kind of psychopaths are these people. Stay away from anyone offering more than what your asking. What a scammmm. The bank was real but the account which the check was drawn on wasn't. They went to great lengths to make it look legit but there greed gave it away. New countertops can be found for less. I discovered a car sale scam on craigslist. It seems the seller was unloading a 2003 Toyota 4wd pickup. When they replied they first thanked me for my interest (why thank me?). Then they explained that the seller was a military member who had just been promoted and was being transferred to an air base in Hawaii (being former military I found being transferred because of a promotion to be unusual). Then the reason for the low price, quick sale because seller is in arrears on a mortgage (didn't need to hear that hard luck story, but a hard luck story like a death, divorce, accident is usually included in a scam ). Then the scam, truck is crated up and waiting shipment from an air base in ND, to a military installation close to your location. They tell you the shipment is being managed by the US Army Logistics Department (No such entity, these shipments were managed by the TMO at the air base). Then I was told to go to ebay motors and ask them the details of the transaction (of course they tell you that you are protected (from what? as close as you can get to ebay's buyer protection plan). The grammar was a tipoff, since they always used "from" rather that "at" when referring to a location. They asked for my data so they could tell ebay. Anyway, realizing it was a scam, I replied with a thank you, but would pass because of all the rigermerole involved in a sale. Please, be aware that the amount on the check is more than your asking price. The excess amount is for the (Shipping).you are to send my shipper the excess amount when you receive the Check.I will Be Happy if My Offer is Granted. I had the same reply to my ad for a keyboard I'm selling. Please, be aware that the amount on the check is more than your asking price. The excess amount is for the (Shipping).you are to send my shipper the excess amount when you receive the Check. I will Be Happy if My Offer is Granted. - He calls you again and makes his ridiculously low offer. You're missing one more. Great apartment deals by pimps to lure in their next prostitute. I replied to a free posting for new carpet remnants. I told them I would pickup the next day and was given an address. I searched the address on Google Maps and saw the address was fake but the location was a wooded dirt road. I replied by text asking if I had the incorrect address I could not locate his home and it appeared to be a vacant wooded lot. The reply was "yes it's a large piece of land". My gut said this didn't feel right so my reply text back was "I'm sorry I will need to cancel the pickup as I am not comfortable with that area." The reply I received back from him was "LOL OK". Now just that reply was scary to me. If legitimate. the person would have offered to meet me some where so I would feel comfortable. Wouldn't you think? Hi all... here is a thought....when scammers ask for your personal info, give them your local sherrif or polices address, phone and your Governors name...fight fire with fire. To make sure that everything goes smoothly i would wait for the it to clear before the pickup is done, I will be responsible for the pickup and it will be done by the movers and their payment will be included in the check i mail to you and this is all due to my disability (am deaf) and it makes it hard for me deal with this and it makes the transaction better and quicker. I know you were not expecting this and I would have loved to come for the viewing but i cant I really want it and am offering an extra $50 for you to delete the posting to show i want it as i am just settling into my new house i want good deals to furnish the apartment i stay in. 1- THE PAYPAL SCAM. They'll send you money through your paypal account to buy items from you like a cell phone or even a car they ask you to leave the car some where with the key in once the pay you through PayPal. . Then claim they never received the item. PayPal will take the money from and give it to the scammer. Usually this scams come from Russia and Nigeria. Never ship your item or except PayPal payment. There is new one I'm investigating right now. I guy texted me offering me to send me a 3 new iPhone 6 and pay him once I receive the phones sounds too good to be true. He is asking for my address. BEWARE. been looking for a camper on criegs list, the last two really good deals I've called on have answered saying person at extension bla bla bla is not available, so i text the number, it text back and said the camper belong to his mother and for me to email her at AntoniaCastro@ pretty sure its a scam, just wondering what they might use my email and phone # for since that's all they'll be getting. Anyone know? been looking for a camper on Craigs list, the last two really good deals I've called on have answered saying person at extension bla bla bla is not available, so i text the number, it text back and said the camper belong to his mother and for me to email her at and gave me an email address, pretty sure its a scam, just wondering what they might use my email and phone # for, since that's all they'll be getting. Anyone know? I received the nearly identical emails below regarding some furniture I wanted to sell. I'm thinking they're scams. Hi, Sorry i'm afraid i just checked my daily/work schedule and coming to view won't fit due to a busy work frame but would appreciate if you could email me pictures. I'm fine with the condition/price and willing to add an extra $20 to reserve it for me and avoid other buyers. My form of payment will be via business or personal check which could be cashed instantly or deposit for clearance and after that we could proceed with the pick up arrangements so you can be rest assured. I would be responsible for the pick-up as i have other belongings to be moved alongside and to avoid any delays, the movers/pick-up fees would be added to the payment.. If you're okay with the form of payment kindly write back with necessary details (name, address and phone # to discuss further) so i can make out payment asap via FedEx or USPS next day delivery . The scammer sends you a "Cashiers Check" for the full amount plus freight. You go to your bank and cash the check. The shipper shows up to pick up the merchandise, takes the cash money for the shipping and either picks up the item or goes to lunch, saying he'll be right back. Either way he's got the real cash. Then the "Cashiers Check" bounces, the money comes back out of your account, and the scammer walks away with the cash for the freight. He never wanted the item - just the shipping money. And if he's slick enough, he got it! Anyone who responds saying they need to be contacted through their direct email, simply call the number attached to the text response. If the number is a text only number, well then simply text them back as often as you choose. They get charged for the texts. At least you get the satisfaction of knowing they paid in some small way. I have been advertising a car on CL and I am getting a lot of texts from people who want to make a deal now, without a test drive, without seeing the car, and want me to get paid through paypal. I am being told that a person will come to transport the vehicle, and that I should give my address. No one will call me so I can hear their voice. Not that I am worried about accents, just I want to hear them. I have received something similar to this 3 times. Does anyone know what this is? Cell phone scam: version 2. "You will be given money to purchase phones at Verizon, Apple, and At&t. For each phone you purchase, you will earn $50." What they don't tell you is that those phones are on a contract service under YOUR name. Thankfully i spotted this one before it was too late. People will stop at nothing to screw you over for their benefit. I've seen quite a a few where the seller offers and item such as a computer or rv at a price that is just good enough that you can't pass it up but still high enough that it could possibly be real. Typically they will only provide a phone number to text. Texting this number causes as emails to begin coming in. Every time I've suspect this with an ad in my local craigslist, I google a key phrase from the ad. And often end up seeing very similar ads, often with the same pic in other cities. I always ask buyers to provide a phone number when I'm selling something on Craigslist. A spammer or scammer will not do this. It's also a good way to weed out the flaky people that have no intention of buying. I will not respond to emails that don't provide a phone number. It has worked very well this year as I've sold dozens of items ranging from $10 to $100+! Also people that don't follow these simple directions are not worth responding to in my experience. I've only been in contact with my scammer via cell phone #. He's been texting me from a Long Island area code (though that doesn't mean he/she is IN Long Island or even in the U.S., but I think texting is pretty expensive from over seas). "The property is still available for those dates but your email address did not show up here. Please type it out so that i can send you details of the property." My question is... why does someone need my personal email if they already contacted me without it? There is a company called american standard claiming to help you find forclosed and pre foreclosed homes. They make you pay 199.00 to start and give you a password and username and a list which they say is up to date but it's not. You don't get your money back unless you recieve find refusal letters which won't happen because either the owners aren't really being foreclosed or the home is empty or just purchased. They're even bad with the BBB and go by other names. Thankfully my bank knew of them and replaced the money but others were not so lucky. If you want to find pre foreclosed homes then go on Zillow its legit. SCAM... 619-659-7862 is a "pay ya $50 over asking, send you a check and when check clears arrange for shipping." Wanted address, had phone number from text. I got a text from someone saying they were interested in buying my car. I asked them to call me but they continued to text. Said I need to go to this website first so they would know my car was okay. I said no on the site and again asked that they call me. Another text with a different website they wanted me to go and that time I said to stop texting me. And they did. Weird huh? Here is what i found from trying to purchase a too good to be true truck. I have reached out to Ebay and they verify this is a spoof. Thank you for contacting me regarding my 2003 Dodge Ram 1500 SLT, that I have for sale. This truck is in great shape. I’m the original owner. It has no damage, no scratches, dents or hidden defects. It is in immaculate condition, meticulously maintained and hasn’t been involved in any accident…Has only 61,210 miles, its automatic, with an 5.7 HEMI engine, 4x4, gray exterior and black interior.I have a clear title, free of any liens or loans on it, under my name. I am selling it at this final price of $1,500 because my husband died 1 month ago (he had a heart attack) and it brings me bad memories and that’s the reason I want to sell it a.s.a.p. I want to use eBay services for the safety of both of us so if you’re interested in purchasing this truck just email me with your full name, address including the zip code and phone number, so I can notify eBay that you are selected as my possible buyer and they will contact you to explain the entire procedure. What about people asking for your email or to text them? Probably not a subscription scam. I don't think you can be signed up for services just by typing in anything. You'd probably need to type in some kind of code. Hi-- so I posted a couple of different pieces of furniture on CL. At 1st, I made the mistake of putting my cell # & got A LOT of spam texts. EG-- " I will send my assistant, need to pay thru paypal, etc" so I took my phone # down & have ONLY CL mail. So in the last 2 days, I received CL mail relay (gotta be the same person w/ 2 different emails as this person keeps saying "I get off work at 5:30 & would like to see your furnite. Is Wednesday (tomorrow) okay? Please email me back at blah blah blah @ gmail" I don't want to email anyone back at their email so I simply replied to the CL email asking which pieces are they interested in?? Is this normal that people ask me to email them directly?? Can they do anything w/ my real email address?? Oh yeah, btw, what got rid of the SEVERAL spam people was when I replied " cash only, all transactions done at my local P.D.!! " what should I do?? I called a man on Craig's list selling a small apartment size oven. He told me that he owned a apartment building, and the oven for sale was from one of his units. So , he quotes me a price of $250, and I agree to purchase the oven. I go to this building with my husband to purchase the oven. The guy shows up 20 minutes past the agreed time, takes us into a basement through one of those storm shelter type doors. Once we're in the basement the guy says the oven is gone he don't know what happened to it , and starts searching through different rooms looking for this oven. He apologized, and we left. Don't know for sure if we were being set up for a robery or not. The experience was a bit strange. Now I'm concerned. I'm in the middle of the over-payment scam right now, but didn't know it as such before giving out my name and address. "I'm Alex by name," never offered over the asking price, but said he'd send a check, which I could first deposit, then could contact him and "his shipping company" would pick it up. It was later that the over-payment part came into play. I've not yet received any check, and was suspicious about the reason for the over-payment (he could've called his bank and stopped payment), but now am worried that he has my name, address, and cell phone #. (This is my very first CraigsList ad and didn't know NOT to give a phone #.) someone else, here, was concerned with giving out similar info, but no one responded to her question. I had the same thing just happen...gave out my name and address...obviously my phone number was used for the text. Not going to deal with this person anymore but not sure if I need to be worried about identity theft or something. I have a guy wanting to buy an item from me. He says he will pay $40.00 more than my asking price due to him having to put me off twice. He says he will bring cash. Is this a scam? This is a very old scam, I heard of it 6 yrs ago. Google it. It's not even a girl- it's professional con men, they have net works and make hundreds of thousands every year. They hire girls or prostitutes to pose for sessions. They are patient to work with you weeks. In the end it's all about $$. Look up "on-line dating scams". (They target middle aged single men). A big one you're missing which is quite frequent, is the send your full name and address so I can send you a money order in 3, or more days. The text or email usually comes after a message of do you still have it? You've probably shown a picture of something outdoors or on a porch. A roving band a thieves wants a nice big list of addresses they can visit at night in the next few days and pick up lots of things in your area..on the five finger discount. Who doesn't negotiate? Also if this is a text, you'll usually notice this one came from an area code..way..way away from you, like 3 states over. That's because they're doing this from a no contract phone that's untraceable. I get this one a lot and think it should be your number 1! BTW the cops act oblivious to any of these scams. and if you try to PRE-warn them they don't follow up or care. I had the same guy trying to lure me to several different inner city locations to deliver to him because I had several sets of tires and he didn't know I was the owner of all of them. So he tried several times! The cops didn't care when I called them said they hadn't had any problems, even though the police blotter mentions several people having this happen to them, and I've got to think he has some success in mugging people who stupidly show up. The car is located in Mobile, AL at DAS ( Dependable Auto Shippers ) headquarters, in the container, sealed and ready for shipping. I would like to use eBay Vehicle Purchase Protection,so we can both be protected and insured.You will have 10 days so you can inspect the car. Once you have inspected the car and decided to keep it, you will confirm your decision to eBay and only then they will re-route the money in to my account, but if by any reason, you won't be satisfied with the car you can return it back for a full refund of your money. I will take care of the shipping, don't worry. You will receive the car with all the necessary papers (clear title, bill of sale, user’s manual, insurance etc). Just get back with your full name and full shipping address and I will get everything started as soon as possible, then eBay will contact you with more further instructions. Here is the email from one of my experience while selling an ipad. She seemed genuine in initial emails. Unfortunately I provided her address but not my home address, instead I gave address of my office which is a secure building. But then after receiving this email and checking forums from you guys, I guess I could have been a potential victim. So, I just refused her. But not sure what to do with the check if I receive it. coming for the pick up.